Back in the 1890s when player pianos were hot, Becker Brothers, one of the more well-respected manufacturers, opened a factory on Tenth Avenue. The factory closed around World War II, but today the sign for Player Pianos is still clearly visible above this bodega. "One of your favorite cards from the 1990s." Not so much a favorite card as a favorite set. I love the early '90s Studio sets because of all the quirky information on the back. I recently completed the '93 set and will be spotlighting it on this blog soon with a card-a-day feature. I love blurbs like Jose Canseco's obviously tongue-in-cheek "Might have been a nuclear physicist if he wasn't an athlete". I've done a few previous posts with remnants of Manufacturers Hanover Trust, once one of the largest banks in New York. 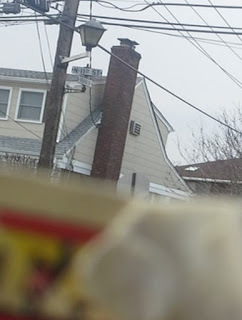 Here are some more - two examples of the company's 1960s-era logo (the letters M, H and T inside each other in a box) still visible on the sides of buildings. "One of your favorite cards from the 1980s." There were so many great, goofy cards in the 1980s it is hard to pick just one. 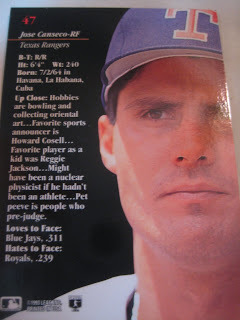 But this Glenn Hubbard card has so many things going on it is just fantastic. Read the backstory behind the card here. Cue Magazine provided ratings of New York restaurants and other cultural institutions - like an early version of Zagat ratings. It was acquired by New York Magazine in 1980; its listings were incorporated within that magazine for a few years but it is long defunct. 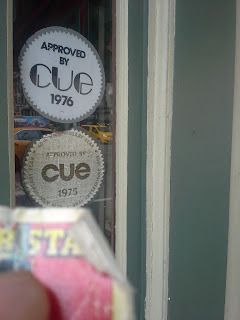 However, the Isle of Capri restaurant on Third Avenue still displays its "Approved by Cue" stickers for 1975 and 1976. "One of your favorite cards from the 1970s." I'll keep it vintage (for me, that means pre-'78) with this iconic Billy Martin card that I picked up in a street trade. I usually don't pick up vintage in these trades but for the classic subtle middle-finger shot I had to make an exception. A few very old enamel street signs have survived in New Hyde Park. 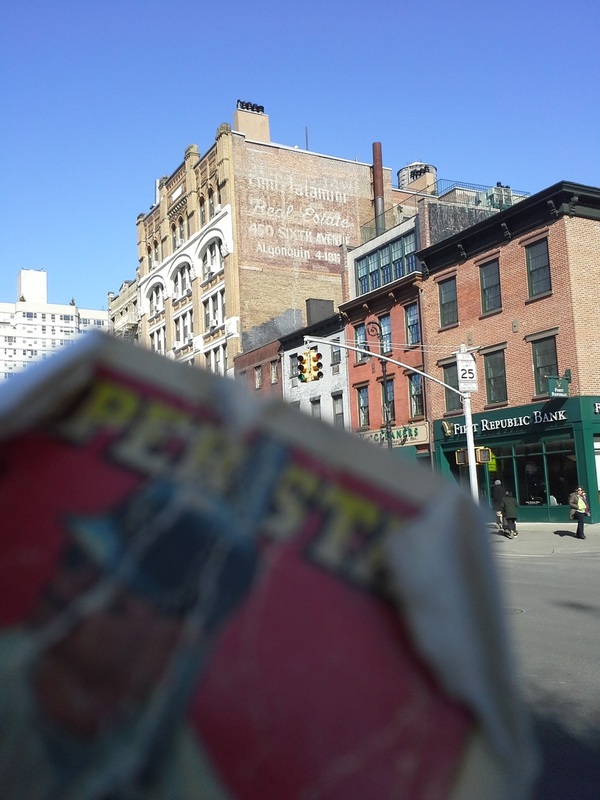 According to Forgotten New York, this blue sign dates back to the 1920s. . .
while this white one dates to the 1950s. 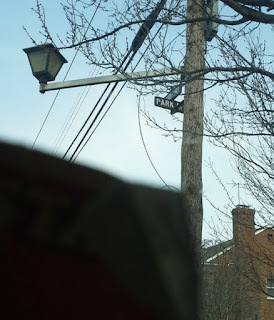 Almost all street signs are metal these days, so the survival of these signs is a rarity. "One of your favorite cards from the 1960s." I only have a couple of dozen cards from the 1960s, but this one stands out for me. I really like the interesting background with a lot going on, particularly the nice view of the outfield of the original Yankee Stadium. The Metropolitan Transit Authority, which runs the Long Island Railroad, NYC Subway and Metro North Railroad, changed its logo from an M to the full MTA in a circle twenty years ago. However, on some older M3 railroad cars that date back to the 1980s, the old logo can still be seen peeking out behind the new one. Al had a horizontal Derek Jeter card - horizontals are a no-no for his set-up - and thought it was one of the ones I gave him. It wasn't but he gave it to me anyway as it was one I actually needed, from the 1997 Fleer set. Glad to have it! "A card that reminds you of a family member." 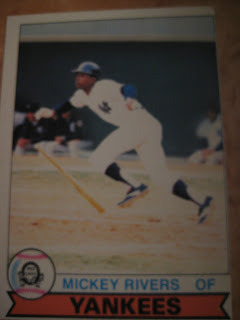 I was born during the 1977 season, when the Yankees were resurgent and one of their best players was Mickey Rivers. My dad has always been a big fan of stolen base threats, so at that time Rivers was one of his favorite players. When my mom was pregnant he would tell people that he was going to name me after Mickey Rivers. He was joking and my mom would never have allowed it anyway, but ever since I heard that story when I was a kid Rivers was always one of my favorite players, though I never saw him play myself. "A card you bought in person and the story behind it." Almost all my card purchases are in-person, and I'm not sure of any real stories about one card or lot of cards bought. So I went back to the archives of my blog to see the first in-person purchase I made since starting this blog in 2009. I found a purchase from a Craigslist seller in June of that year - several albums and a large box for $10. Looks like it was mostly junk wax but at that time I needed lots of junk wax. Fast forward eight years later and I've completed a lot more sets - enough that I don't pick up lots from that era unless they are free - but, like in the second part of my posts on that haul, I still have lots to trade from 86-93 Topps, Donruss, Fleer, Score, Upper Deck and Bowman, so if any of you readers need that stuff let me know! 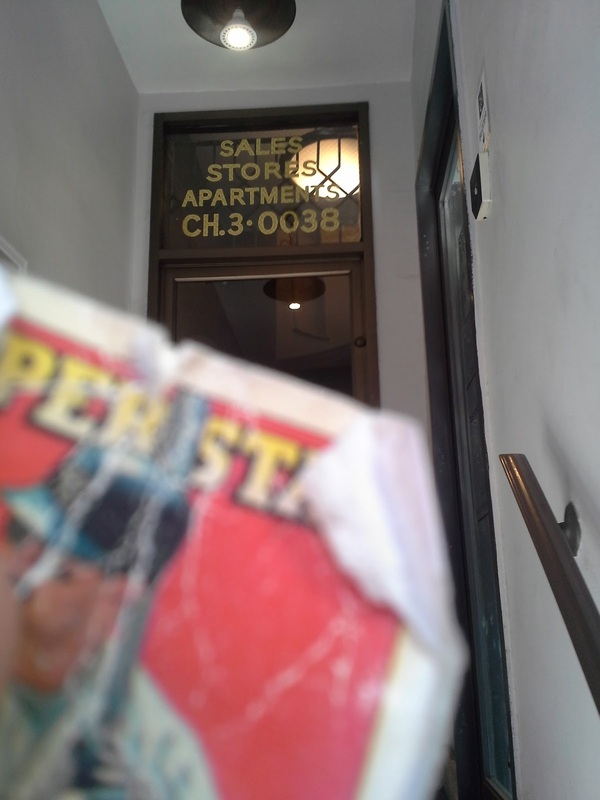 One of the Craigslist transactions I referred to in my recent post came through, and I picked up about 500 cards from a guy on the Upper West side on Friday, costing nothing more than the Metrocard to go there and back. 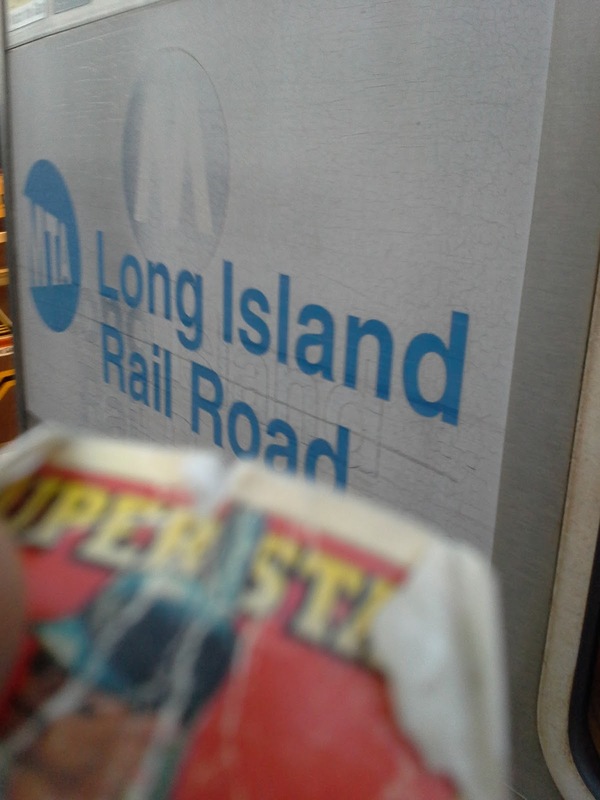 They were all loose inside a flimsy plastic bag that was not going to hold them for long, and there was a lot of junk wax, so I sat on a bench on Broadway and 93rd street pulling out the cards I knew I didn't need (i.e., cards from sets I knew I had finished). When I was done I still had about 150 cards I knew I might need. Hopefully someone found the cards I left on the bench and are having a good time with them. Here are some highlights of the cards I hung onto. There were a bunch of 1995 Ultras, and mixed in was this great Gold Medallion parallel. Here's a 1994 Bowman preview card. Nice rainbow foil here. There were a lot of Classic cards from 1992 and 1993 from sets I didn't recognize. Pretty awesome getting an early Bernie Williams I did not have. I already had the full Kay-Bee sets from 1988 and 1990 but here were a bunch of 1989s. Dave Baldwin pitched for the Senators, Brewers and White Sox from 1966 to 1973. In 176 games, all in relief, he went 6-11 with 23 saves and a 3.08 ERA. After his career he a Ph.D. in genetics and worked as a researcher and engineer, as well as a published poet and artist. He has written a memoir about his baseball career called Snake Jazz. He kindly answered my questions about baseball cards. - Do you have any stories about cards of yourself or of other players? 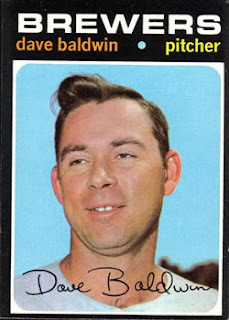 My most popular card is the 1971 "Howdy Doody" impersonation. 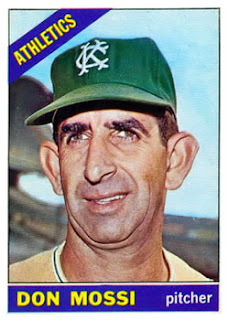 One blog called it the second ugliest baseball card ever. Here's how it happened. In 1971 I was in spring training with the Milwaukee Brewers. I had pitched well for them in '70, so I wasn't expecting any abrupt changes in my career. One day I had finished running my laps and was headed for the showers when a photographer suddenly appeared out of nowhere and said, "Could you take off your cap, please?" I was tired, sweat was dripping off every part of me, and I was thinking hard about an long overdue lunch. I took off my cap, tried to comply with his "smile" command, heard a click, and then continued on to the locker room. I had no idea the photo was for a Topps card. If I had known, it would have occurred to me that I was about to be traded or sold to another team -- players are asked to remove their caps so that the cap of the new team could be added easily. A couple of days later I was told that I had been bought by the Hawaii team of the Pacific Coast League. My major league career was at an end, essentially. second ugliest because Mossi's was definitely the gliest. Absolutely. Only those of Don Mossi. "A card you spent more than $10 to get." One of the things about card collecting that I enjoy is that is not hard to get a lot of cards for a little bit. Ever since I got back in the hobby and found dime boxes at the flea market, I resolved not to spend more than a dime for any one card. And often with my big Craigslist and garage sale hauls I have often gotten good cards for well under a penny each. - "Complete fleer sets from 1983 to 2003". Trying to pin the guy down on what sets he means exactly. Don't even know what price he is going for. I only pull the trigger if it's a really good deal so most of the time I get shot down which is fine. - Huge box of early-mid 1970s cards for $20. The guy has another buyer but if they don't show up I'm next. I don't ordinarily collect vintage (due to price) but this is too good to pass up. Cards in the box include a Dave Winfield rookie and a Hank Aaron 1972 Topps. That alone would be $20 I would think. So what is the most I have spent on a single card? I think I can guess. 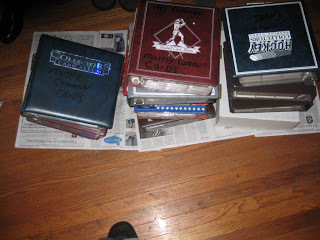 Back when I first got back in the hobby in my early 20s a friend of mine had some cards he wasn't interested anymore. We agreed to use Beckett values for the cards I needed so he would get a fair price - I didn't want to nickel-and-dime my friend. I think the most expensive was this Bernie Williams rookie, probably a dollar or two in the Beckett book at the time. Peter at Baseball Every Night is holding a contest where he wants bloggers to write a post about their favorite card of their favorite player. I found this to be a really tough challenge. I am not a person to generally have "favorites". This made me think about the question, "What is my favorite baseball card?" I had never asked myself that before and I really don't have an answer. I couldn't even tell you what my favorite set is. There are things I like about all of my cards. Here's another great alphanumeric phone exchange that has withstood the test of time. This sign for J.R. Moyer Sons features the phone number Cloverdale 8-9600, which would have been replaced by a seven-digit number 50 years ago. This sign can be found on a fence on W. 12th Street. 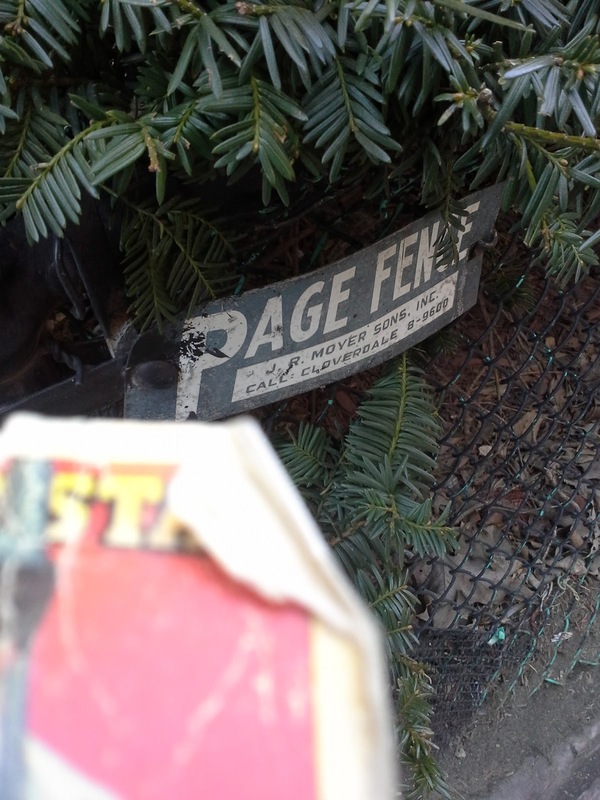 Here's another Greenwich Village realtor with an old alphanumeric phone exchange. This sign is not nearly as big as that of Emil Talamini, but Bernard Charles Real Estate is still an active company. "A rookie card of one of your favorite players." I guess I could have found a rookie card of another guy I've really liked over the years, like Pagliarulo, Sierra, Soriano or Teixeira. But I am going to stick with Mattingly here because all of his cards are so iconic. I don't know for sure if I would say he is my favorite player, but he is my favorite player to get cards of. Emil Talamini was a Greenwich Village realtor who died in 1970. 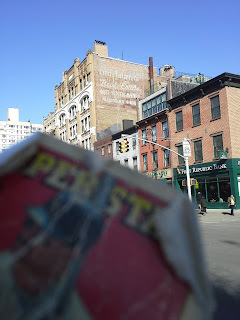 And yet his sign still towers over 6th avenue with the old-fashioned phone number, ALgonquin 4-1817. Day 3 is "A card from the first set you tried to complete". Like many out there, 1987 Topps was my first entry into the baseball card world, though I had collected the Topps stickers the year before. At the time I was ten and my sister was six. I would buy packs when we would go to the stationery store, and my mom would buy packs for my sister too so she wouldn't feel left out, even though she didn't care about baseball. Normally I didn't care if she got cards that I didn't have, but I got pretty upset when she got this card which I didn't have. Fortunately she saw that I really wanted it and gave it to me. Still one of my favorite cards today. 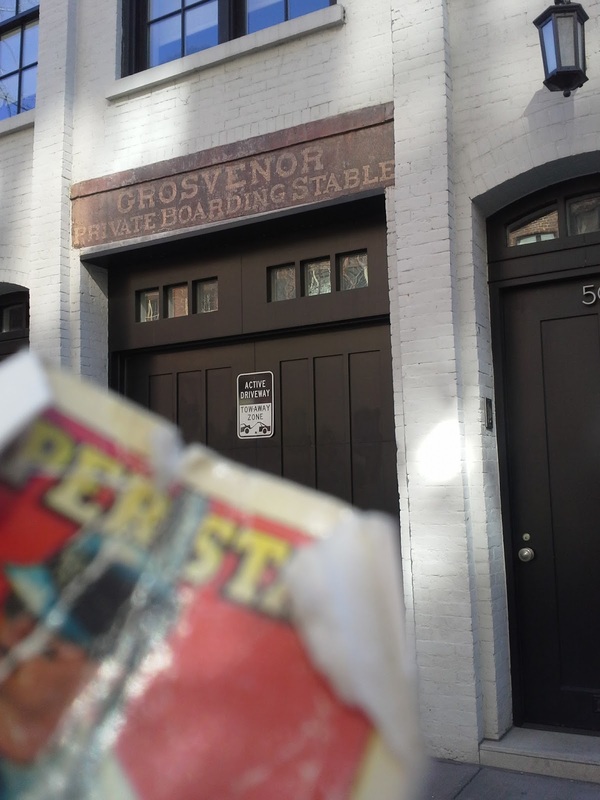 The Grosvenor Private Boarding Stable was built in the 1870s, possibly connected to the nearby Grosvenor Hotel which was opened in 1871. By 1900 it had been converted to a private residence, and owners of the building included famous entertainment personalities Maurice Evans, Edward Albee and Jerry Herman. The sign which possibly dates to the nineteenth century when it was a horse stable still hangs over the entrance today. Today's challenge is "a card with more than one player on it". I like cards with cameos by other players on them. This one is my favorite. It is the 1983 Topps Ed Glynn card. 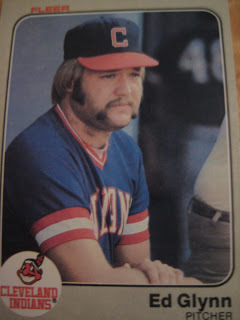 It is an error card because the guy in the mustache who is the subject of the photo is actually Bud Anderson. But see #48 lurking behind him? #48 on the Indians was none other than . . . Ed Glynn! So he appears on his own card after all. The warm weather is back and so is Al selling cards on the corner of 37th and 6th. He needed some Paul O'Neill's so I exchanged a few for these three cards. A refractor, a parallel, and a parallel refractor. Joy of a completed set - 1993 Studio! I am mildly surprised I finished this one before 1991 and 1992. I've always loved the backs of the early Studio cards with the quirky personal information. I had always wanted to do some kind of long-running series on them, so now that I have competed this set I will start with 1993. 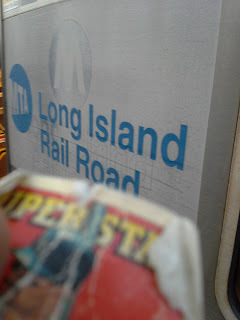 Once I am through with the 30-Day Baseball Card Challenge that is going to be the next thing I do here on this blog. He hit a lot of my other set needs to, including knocking out several dozen 2008 UDs from my lists. He through in some random Yankee cards as well, including this Jorge Posada National Chicle card. This one is smaller than the last, less than 20,000 cards for sure. But 16,000-17,000 cards, mostly from 2000-2007, for just $20 I just can't pass up. A few hundred 2002 Fleer Maximum, a few hundred junk wax, but mostly cards that I will either need for my collection or shouldn't be too hard to trade. I've barely had time to go through it and am having some computer issues, but here are some quick highlights of other sets that are highly represented (though there is a ton of variety, and stars and inserts are plentiful unlike other collections I have bought). The next trade-a-thon, when it happens, will be epic. Lots of sorting to do first! Joy of a completed set - 2002 Topps! Many from 2003 Play Ball but I was especially glad to get this one - because I already own the original artwork! Not 1989 Upper Deck but a throwback set UD put out in 2002. Don't know what it was called. Every year before Opening Day I do a post where I predict each division's standings. Last year I picked both the Cubs and Indians second - not too bad I guess. This post is illustrated with cards from 2002 Fleer Maximum. Why? I bought another huge collection today, and this set is coming up quite a bit as I go through it. Will be plenty to trade from here when I am done. I'll always pick the Yankees, even when their own General Manager says they likely will be going through some growing pains at best. But hey, if the rookies live up to their potential and the veterans stay healthy and solid, they could sneak into the playoffs. That's a lot of ifs though. They have an awesome lineup and some big names in their rotation, but pitching health is already a concern and the season hasn't even started yet. Still a dangerous team with some quality young pitching. Hard to remember that they were a playoff team last year. Not a bad team but this is a very tough division. They almost won the World Series last year despite losing their best position player and most of their rotation. Just having a return to normal health could make them a juggernaut. The window is closing, but this group of players had a very good run. With the passing of their win-now owner, Mike Ilitch, a teardown of this team seems probable. Their teardown is already underway. This seems like a team content in its mediocrity. They retooled quite a bit and added some depth to a good young core. Good solid team but probably overachieved last year. They made some moves this offseason but didn't seem to really improve the team. The best player in baseball and not much else. Billy Bean did one smart thing once fifteen years ago and is been coasting on that reputation ever since. This is a pretty good team, the class of a weak division. No bullpen though and the big question is, will Bryce Harper rebound? If the rotation stays healthy and the hitters do their job they could win 100 games. The track records for both of these things happening are slim though. Some good young talent like Herrera and Franco, they could surprise this year. I guess they were jealous of the Mets having quirky old pitchers, so they brought R.A. Dickey and Bartolo Colon so the fans in the new ballpark can be entertained even if the team isn't very good. A year ago they looked like a team on the rise. Injuries and tragedy have made the future in Miami a lot dimmer. They took one of the best players off their biggest rival this offseason, which could be enough to tip the balance in the Central. Everything went right for the Cubs last year - everyone stayed healthy and played to the top of their potential. Even so they just barely won the World Series. Unlikely they have no issues two years in a row. A lot of the best young ballplayers in the National League had disappointing seasons last year, like Stanton, Harper and the Pirates' Andrew McCutchen. Seems like the fortunes of this team rest on how well he bounces back. Seems like this team is always in rebuilding mode. Joey Votto's Reds look a lot like Mike Trout's Angels, both in uniforms and in team construction. This was an exciting team to watch last postseason, and this year's team is likely to be even better, particularly with the resources to upgrade during the season as necessary. Could be this year's Cubs. Like the Royals, the window is starting to close on this talented team. They are building up some good young talent and might be just a year or two away from serious contention. Hard to see them being competitive in this pretty tough division. Seems like everyone is picking them to be last. Who am I to argue?